Are you allergic to a host of chemicals and you are looking for an organic solution to common problems? Calendula oil is your one stop solution. Many of you might have already heard about the uses and benefits of the beautiful flower calendula. Apart from being very attractive, it has several uses and can potentially have many health benefits. Calendula officianalis is the most commonly found species of the popular marigold flower. It has many benefits apart from adding beauty to your garden. The petals of the flower are edible and can be used in soups and salads. The leaves and the stem boast of a powerful chemical extract which has glycosides, anti-inflammatory and anti-oxidant compounds. In short, the entire plan can be extremely beneficial in many ways. 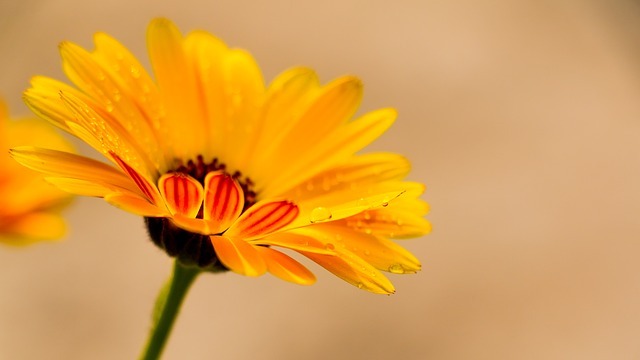 Read on to find out more about calendula oil and its many uses and benefits. Calendula petals extracted in a variety of different mediums gives rise to what is known as calendula oil. Tinctures, salad dressing and infused oils, calendula can be used in many ways. Even teas with honey are used for long lasting herbal syrups. Calendula essential oil is available widely and you can search online for it. Calendula oil, safe for both children and animals, can be used in many forms. It can be used in foods as coloring or for skincare products like lotions. You can grow calendula in your garden in the summers or buy calendula oil online. Skin benefits of calendula oil are the most numerous. Being an essential oil, it does not have harmful chemicals, making it very useful. It can serve a wide range of purposes from first aid to beauty requirements. It can generally be used directly for all purposes, but you can also use it in the form of lotions or balms. Dry skin – Containing carotenoids, it nourishes skin along with moisturizing dry skin. It supports integrity of skin and increases its moisture retaining capabilities. Antiseptic – It possesses antiviral and anti-bacterial properties which make it an ideal antiseptic. You can safely use the oil in small cuts and bruises as well as bed sores. Thread veins and scars – Thread veins are basically broken tiny veins on the face. These can be healed and treated by using calendula oil as a face wash. You can also infuse it in your bath water. Scars can also be treated in the same way. Appearance of skin and anti-ageing properties– It can enhance the flow of blood to the cells. It has antioxidant properties that help combat wrinkles and age spots. Smooth skin in a consistent tone can be achieved using calendula oil. Wounds- Among the many calendula oil uses, healing of wounds is a very pertinent one. Apart from working as a good antiseptic, it can be used on both old and new wounds. Wound closure is accelerated with the use of calendula oil. Protein metabolism, which helps in the regeneration of new skin, is also enhanced. Using calendula oil twice daily for slowly healing wounds is ideal. Calendula oil can be used for wounds in the form of lotions or creams. Usage of calendula oil during dressing of wounds has proved to be helpful as it reduces discomfort. Cell proliferation is boosted that helps in quick recovery of the wounds. Burns- any kind of inflammatory diseases as well as sunburns can be treated with calendula oil. It is seen to provide immediate relief. Preventing dermatitis – Especially for patients who have undergone breast cancer treatment, usage of calendula oil has shown many benefits. Piercings – With its anti-septic properties and wound healing properties, it can be used for piercings. This ensures good care of the piercing which can otherwise attract germs and give you a lot of trouble later on. Arthritis- Pain from arthritis or gout can be cured by using calendula oil in the form of balms. Bites – Mainly due to its anti-inflammatory qualities, this is a good option to use in the case of minor animal bites. Diaper rash – A common concern amongst babies, calendula oil along with a bit of bentonite clay sprinkling, can treat diaper rash, They are suitable and not harmful for cloth diapers either. Homeopathic calendula cream for the baby and for curing the c section wound has been the go to solution for many new moms. Lip balms- Calendula oil can be used in lip balms too for chapped and dry lips. 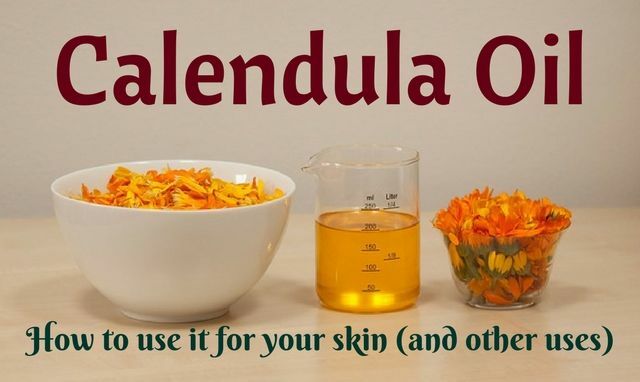 By now, you are perhaps sufficiently convinced about the many uses of calendula oil for skin. A pertinent question here is whether you can make it by yourself at home or not. Making the infused oil yourself is not only a cheap and economical option but also is a very easy process that won’t cause much hassle. You need organic dry calendula petals and olive oil for the process. After placing the petals in a clean jar, pour in the olive oil. The level of the oil should be one inch on top after the petals are submerged. The petals expand and hence you add the excess bit of oil. Cover the jar and shake it well. Set the jar on a towel on your crockpot such that water covers about half the jar. This should remain this way for around 2-6 hours on warm. Strain out the oil using cloth and store. Ideal conditions for storing are a cool dry place. Or, there is a slower and more effective method that you could try out. After placing the calendula petals in a clean and dry jar, you need to pour in the olive oil, covering the petals till the oil is one inch above them. You can look from below to figure out the amount of oil to be added as the petals often tend to float in oil instead of remaining submerged. Cover the jar with a lid and shake it. Place the jar inside a paper bag and store it near a warm window which allows a lot of sunlight in. Shake the jar a couple of times every day. Let the jar stand for around 4-6 weeks. Strain out the herbs. Now pour the oil in another clean jar. Storage should be in a cool and dry place. Oral health – Usage of calendula in toothpastes and mouthwashes have increased a lot. Anti-bacterial properties of it helps avoiding cavities and other oral health issues. Soaps and shampoos – With its health benefits and skin exfoliating qualities, it is increasingly being used in soaps and shampoos of everyday use. Cough or congestion – Due to its anti-inflammatory qualities, it is effective for curing coughs and congestions too. Stomach problems-The gastro intestinal system can be easily relived of inflammations using calendula. Consuming it with your tea can be helpful in this case. Eyesight- Anti oxidants have many benefits that enhance vision. Macular degeneration and cataracts can be effectively avoided with calendula oil. Cancer- Calendula also has tumor preventing abilities and research is still on for the use of this for the treatment of cancer. If found useful, this can help many. Cramps – Period cramps and pains resulting from system disorders are dreaded by all. With anti-spasmodic qualities, calendula oil can save you from the torturous pain. Adding calendula to your diet will relieve you of these. Salad dressing – With soothing effects on the skins and the digestive tract, you should also add calendula oil to your everyday salads. It has a mild flavor which is like saffron and can be used in place of regular olive oil. Although calendula is one of the safest herbs known, being careful is a necessity. You should avoid it during pregnancy as it has been seen that it stimulates menstruation. Allergic reactions have also been reported when it has been used in high doses or concentrates forms. Consulting an herbal medicine expert or your healthcare provider before using it so that you are completely assured that there will not be any negative repercussions. As is evident, calendula oil has a huge number of benefits and uses. From providing youthful glowing skin to healthcare benefits, this oil is a must have in your household. The absence of any kind of chemical or synthetic additions, make this a healthier and safer alternative to what you might have been using in its place. Organic products go a long way in naturally treating problems with minimum side effects. It is also safe for a child which is an added bonus. With healing, curing, beautifying and healthy qualities, this oil is great. Keeping a bit of calendula oil in your cupboard can save you in many emergency situations.